In 1926, the route US 2 now follows was numbered as NE 15. NE 15 followed basically the same path as US 2 today with a few minor changes. Just west of Old Town, NE 15 followed what is now Alternate US 2, Stillwater Avenue, and ME 16. Between Newport and Canaan, NE 15 followed what is now ME 100 to Pittsfield, then probably Somerset Avenue and Phillips Corner Road. Between East Wilton and East Dixfield, NE 15 followed Main Street. Most of the route was improved (not paved). Some areas were still dirt, including Pittsfield to Canaan, and East Wilton to Dixfield. Sections of the route which had been paved by 1926 included between Old Town and Bangor, and between Skowegan and Norridgewock. By 1928, the road had been renumbered US 2, and had been paved between the New Brunswick border and Island Falls, Lincoln and Pittsfield, Farmington and Wilton, and Mexico and the New Hampshire state line. In addition, the route had been realigned to its current path just west of Old Town. By 1941, the entire route had been paved, and the road had been aligned to its current path between Newport and Canaan. 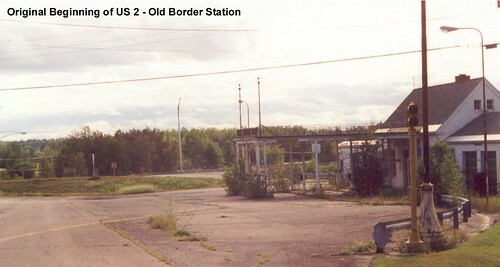 Near Old Town, US 2 was rerouted to what is now called Alternate US 2. By 1963, US 2 had been realigned to its current route throughout Maine. In addition, I 95 had been completed between Orono and Bangor, replacing US 2 as a major through route in this area. By 1965, I 95 was completed between Bangor and Newport, replacing US 2 as a major through route in this area.